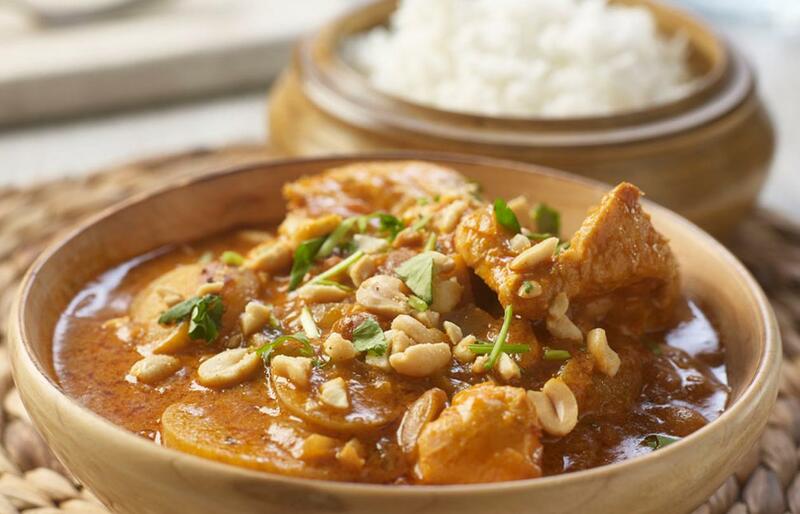 Massaman curry is a rich, fragrant relatively mild Thai curry with potatoes and peanuts that is an interpretation of a Persian dish. Trim, peel and rinse all the ingredients then blend together into a smooth paste. Adjust seasoning to taste then cover and chill (can be frozen) until needed. Pour the sauce into a saucepan and bring to the boil then add the vegetables and chicken then reduce the heat and simmer for 3 min. Turn off the heat, allowing the chicken to cook through gently in the hot sauce over 1-2 min. Season to taste. Serve topped with coriander, the remaining peanuts and coconut rice.